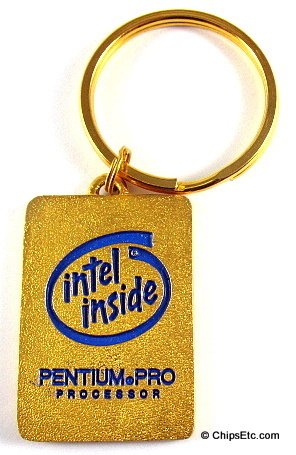 This is a rare Intel keychain. 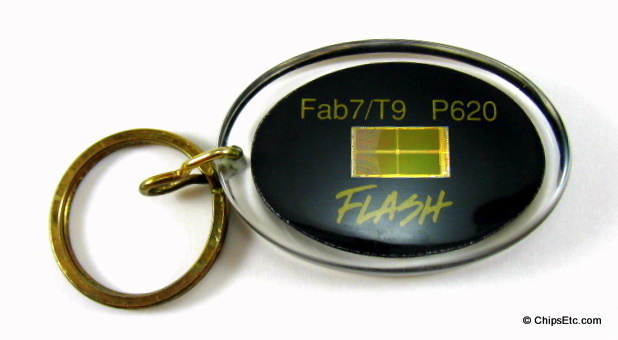 It has Fab 7 / T9 P620 FLASH on the front with a real flash memory chip embedded inside. The back has "Setting a new record for process start-ups Q4 '92 - Q4 '93. Ground zero to high volume." Intel's Fab 7 was located in Rio Rancho, New Mexico. The Intel P5 was the very first version of the Pentium Processor made by Intel. 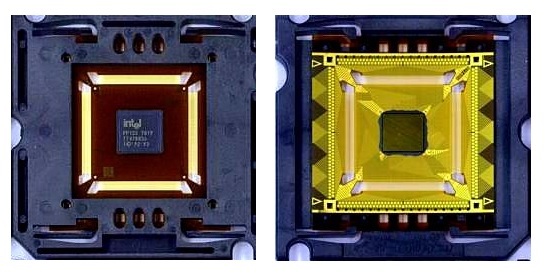 It was manufactured using a 0.8 micron BiCMOS process which made for a larger die size (and power requirements) than it's smaller predecessor, the shrinked P54C. 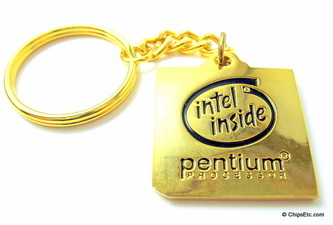 This Keychain has an actual Intel P5 Pentium chip mounted in a gold-plated CPU style package with the Intel logo in black enamel on the backside. 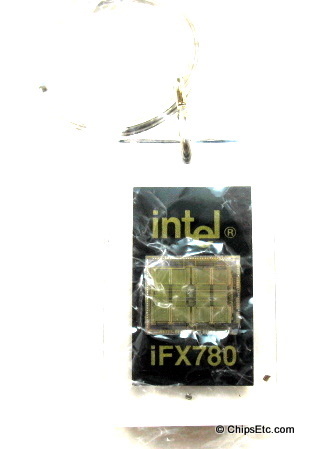 Item #191 comes complete with information card and black velvet case with Intel logo in gold lettering. An Intel FPGA DRAM memory controller Chip in 32-pin plastic quad flat-pack or 84-pin plastic leaded chip carrier packaging. Item is new in original sealed packaging. 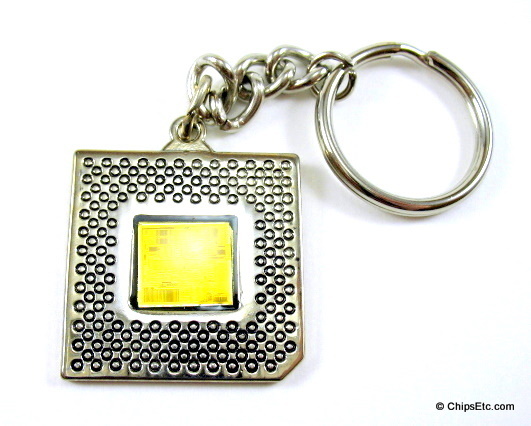 Intel P5 Pentium keychain with polished steel substrate mount. The early versions of 60-100 MHz Pentium chips (P5 & P54C versions) had a problem in the floating point unit that resulted in incorrect (but predictable) results from some division operations. This bug, discovered in 1994 by professor Thomas Nicely at Lynchburg College, Virginia, became known as the Pentium FDIV Bug. 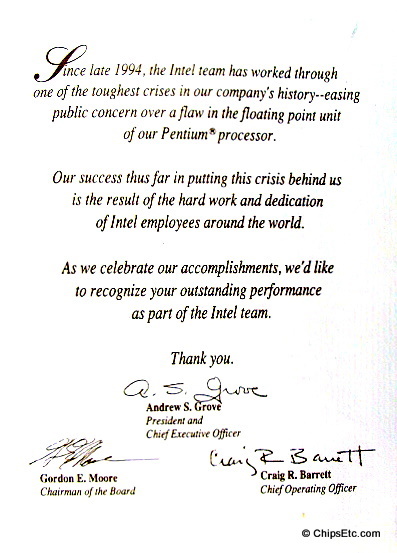 Intel offered to replace all flawed Pentium processors on the basis of request on December 20 1994. Intel eventually recalled nearly a million chips that cost the company a $475 million pre-tax charge. 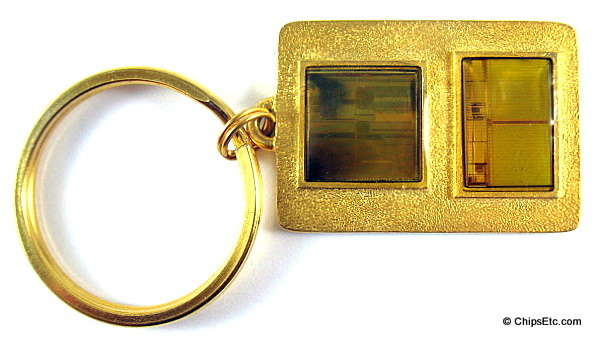 This beautiful black enamel and gold-plated keychain has an actual Intel Pentium P5 FDIV error CPU chip and was given out to Intel employees in 1995, in the aftermath of the Intel Pentium FDIV floating point issue. 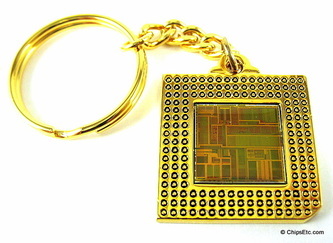 The keychain was attached to a card with a statement from Intel executives Andy Grove, Gordon Moore & Craig Barrett concerning the event. 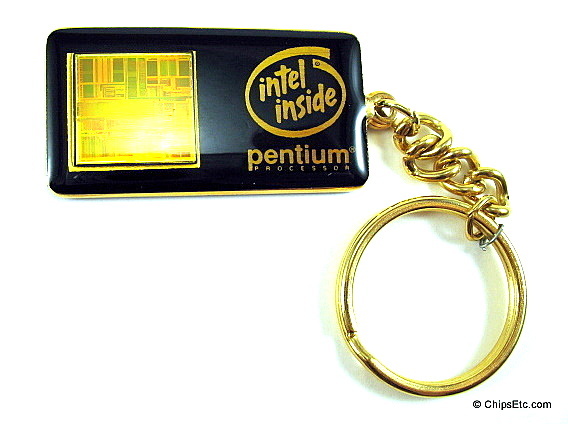 Some of the defective P5 & P54C Pentium chips that Intel still had on-hand were later turned into these Pentium keychains by Intel. 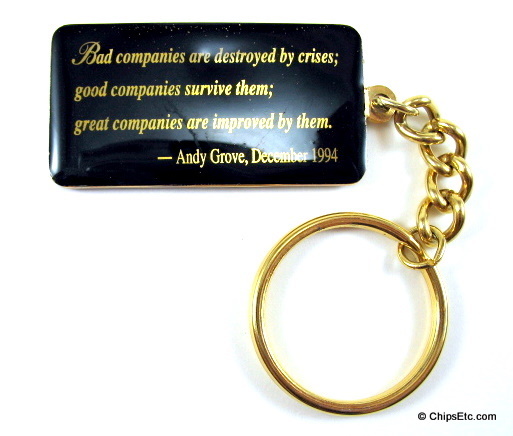 On one side of the keychain there is an embedded P5 (FDIV flawed) CPU and on the other side is a quote from then CEO Andy Grove that reads; "Bad companies are destroyed by crises; good companies survive them; great companies are improved by them." 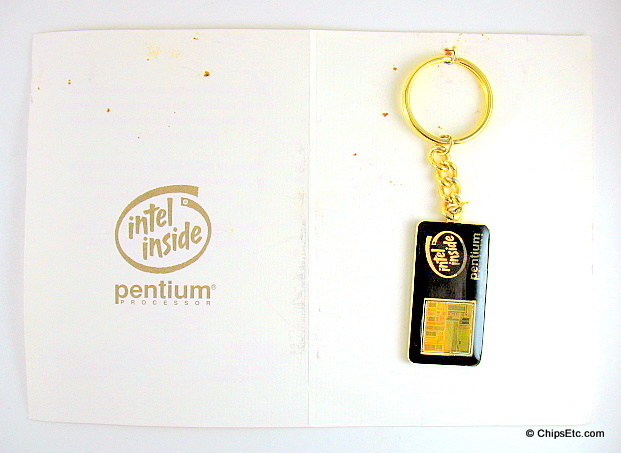 Item #514 includes the keychain attached to an Original Comment card that was given out to Intel Employees in 1995. 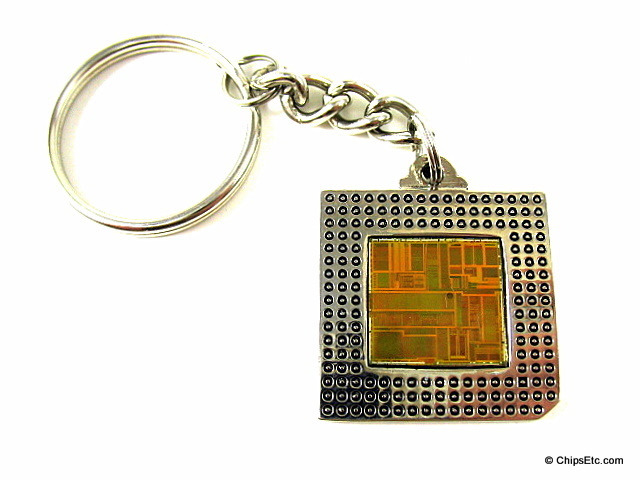 Intel P54C (small die) Pentium CPU keychain with polished steel substrate mount. 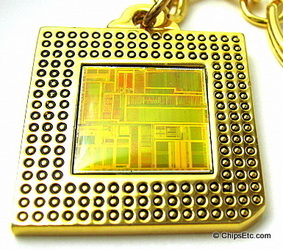 During the mid 1980's to early 1990's, Intel processors (386, 486, Pentium) were designed mostly for use in desktop computers, and came in thick, ceramic, PGA (pin grid array) packages, eventually weighing up to 60 grams each. 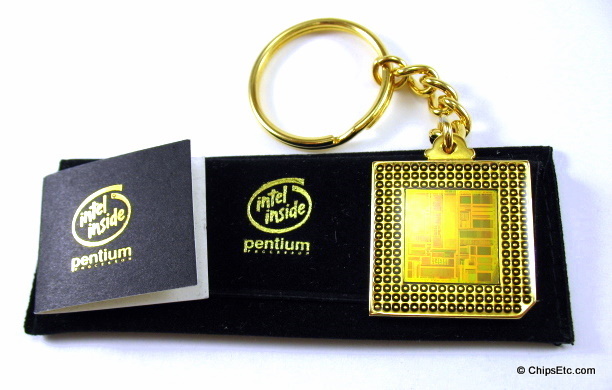 But in 1994, Intel would introduced a new packaging design for it's Pentium processors geared for a growing new market segment - notebook computers. The Intel 50/75 MHz Pentium processors for mobile computers were offered in a new packaging advancement called a tape carrier package (TCP). The much smaller, thinner and lighter TCP package offered opportunities for notebook vendors to innovate and enhance system designs. 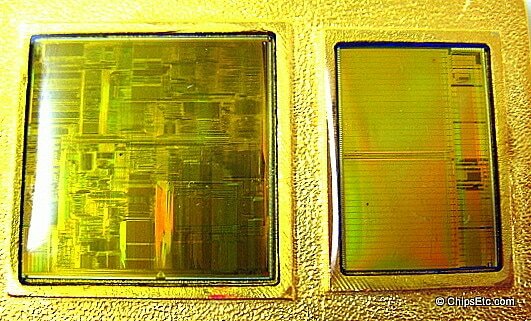 Intel's new TCP package was half the thickness of a dime, and weighed less than a gram! Also known as Tape Automated Bonding (TAB) technology, TCP was not new to the semiconductor industry, but its use by Intel in packaging microprocessors in notebooks was a first for a high-volume product. 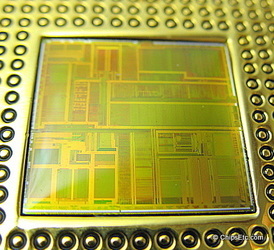 The TCP's "Cavity Cooling System" used conductive cooling to efficiently transfer heat from the CPU to the motherboard PCB. When the Intel TCP was released it was expected to become the preferred semiconductor packaging technology for notebooks, enabling a volume market for systems based on high-performance processors. 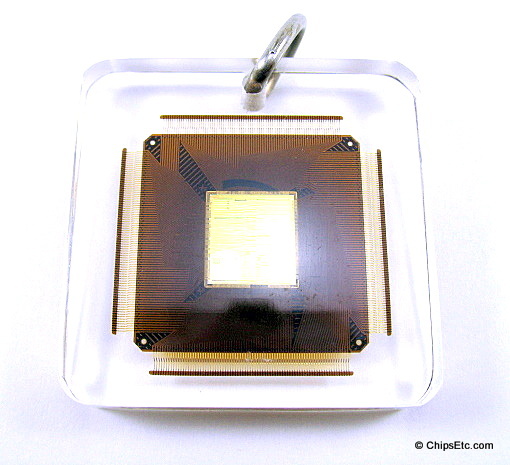 This clear Lucite keychain contains an Intel Mobile Pentium Processor CPU in Tape Carrier Package (TCP). 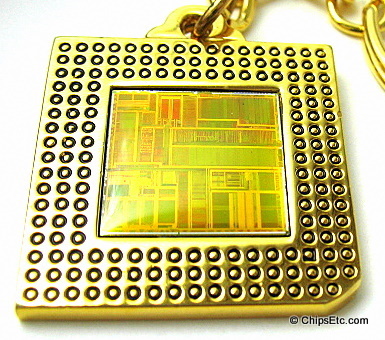 Back in 1994 Intel held a special briefing for the press and analysts to say that it had produced a prototype of a chip using StrataFlash technology and that initial product announcements would be made in 1995. 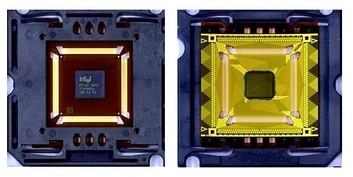 Intel's new Flash memory technology, dubbed StrataFlash, stored two pieces, or bits, of information in each tiny data "holder" within a memory chip. 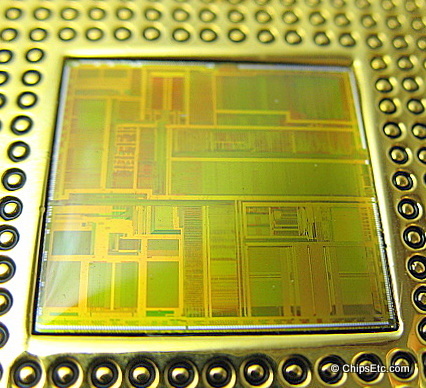 A memory chip is made up of millions of these data holders, referred to as cells. StrataFlash doubled storage capacity, which had traditionally been limited to just one bit per cell. 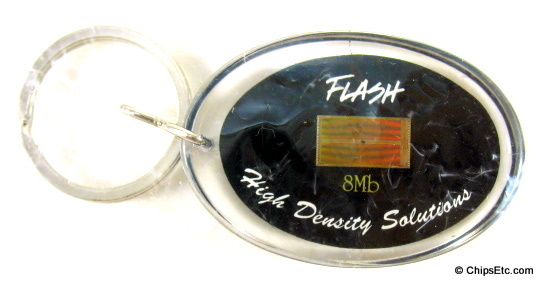 This rare keychain is made of Lucite and contains an actual Intel StrataFlash 8Mb Flash memory chip embedded inside with the words "FLASH - High Density Solutions". The Intel Pentium Pro was a sixth-generation x86 microprocessor developed and manufactured by Intel and was introduced in November, 1995. 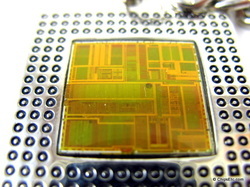 It introduced the P6 micro-architecture (sometime referred as i686) and was originally intended to replace the original Pentium microprocessor in a full range of applications. While the Pentium and Pentium MMX had 3.1 and 4.5 million transistors, respectively, the Pentium Pro contained 5.5 million transistors. Later, it was reduced to a more narrow role as a server and high-end desktop processor and was used in supercomputers. The Pentium Pro was capable of both dual- and quad-processor configurations. It only came in one form factor, the relatively large rectangular Socket 8 configuration. The Pentium Pro was succeeded by the Pentium II Xeon processor in 1998. Performance with 32-bit code was excellent and well ahead of the older Pentiums at the time, usually by 25-35%. However, Pentium Pro's 16-bit performance was the same as the original Pentium processor. It was this, along with the Pentium Pro's high price, that caused the rather lackluster reception among PC enthusiasts, given the dominance at the time of the 16-bit MS-DOS, 16/32-bit Windows 3.1 and 32/16-bit Windows 95. To gain the full advantages of Pentium Pro's P6 architecture, one needed to run a fully 32-bit OS such as Windows NT 3.5, Unix, or OS/2 - usually found only on high-end machines. 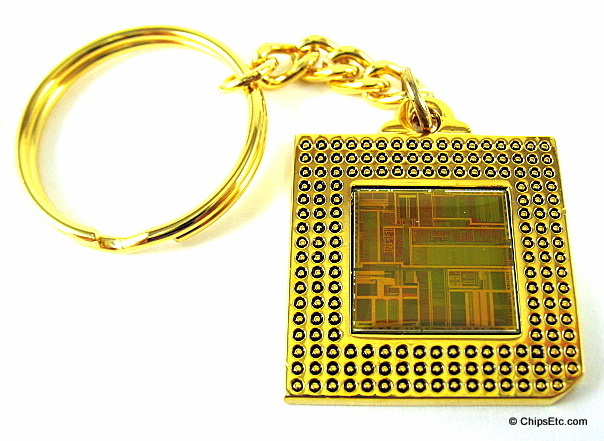 This elegant gold-plated keychain features both the CPU processor chip and the L2 cache 256k chip used in the Pentium Pro processor. 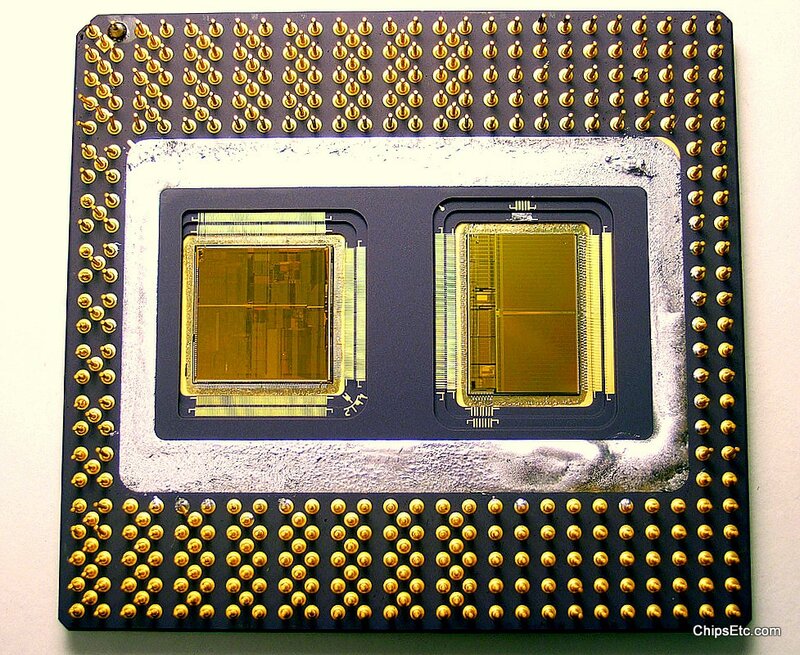 Manufacturing technology in 1995 didn't allow for the larger 256k L2 cache to be integrated within the processor core, Intel designed a separate cache chip that was integrated into the Pentium Pro's packaging. The L2 chip had it's own back side bus, this made it much faster than the motherboard-based caches of previous processors.